Sen. Jones’ book Bending Toward Justice: The Birmingham Church Bombing that Changed the Course of Civil Rights, released in hardcover March 19, 2019, tells the story of the decades-long fight to bring justice to the victims of the 16th Street Baptist Church bombing, culminating in his prosecution of the last living bombers and KKK members, Thomas Edwin Blanton, Jr. and Bobby Frank Cherry. Blanton was convicted in 2001, the first conviction since Robert Chambliss in 1977, and Cherry was convicted in 2002. Melissa Parker (Smashing Interviews Magazine): Senator Jones, why was this story so important for you to tell now? 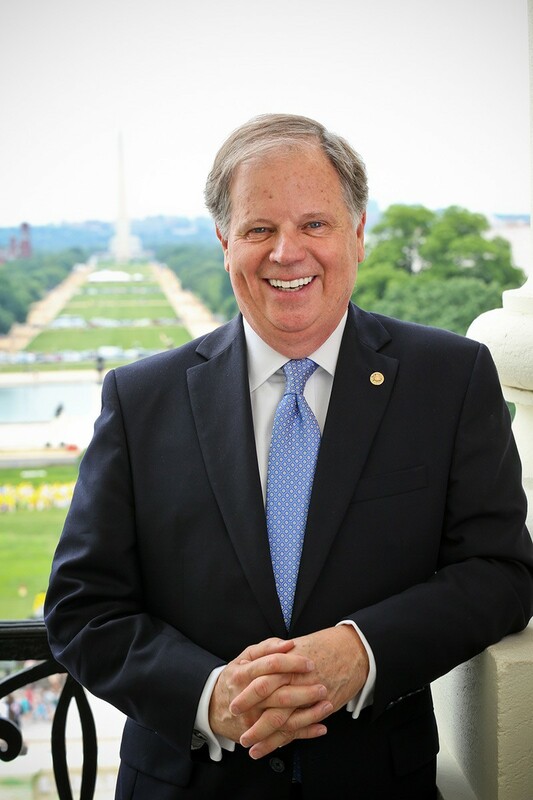 Senator Doug Jones: I think it’s a combination of things. Number one, it was an historic event in Birmingham. It’s an historic event because it maybe didn’t change the course of Civil Rights in this country, but it did accelerate what I think would’ve happened anyway. The second thing is, while we’ve made such great strides in race relations over the last 50 some odd years, we are also backsliding a little bit, and we need to remember those lessons. We only see that on display more often now with the hate speech that we see on the internet and the things that result from that hate speech like what happened in New Zealand, what has happened at the synagogue in Pittsburgh and in Charleston and in Charlottesville. I think there’s some really important lessons from Birmingham that need to be brought back to everyone’s attention. Melissa Parker (Smashing Interviews Magazine): Were the racial issues of that time in the 1960s discussed in your family when you were growing up in Jefferson County, Alabama, and did you have any experiences as a teenager in school related to race? Senator Doug Jones: It was not discussed as much in the earlier years, like when the bombing happened, I was nine years old. It was really not until after I went into junior high for the first time in the seventh grade that more race relations were discussed because it was the first time I had gone to an integrated school. So certainly, you talk about those things a little bit more to make sure that everything was good, there was not a problem, and students, I think, did a fabulous job. There were a couple of things that occurred during my high school years. We were still under court orders in Fairfield at the time, and at one point, the schools were actually paired. We tried to get a bond issue passed to build a new high school. Fairfield High School had been essentially an all white school. When I got there, it was an integrated school, but you had another high school that was still all black. The federal courts felt like that was not good enough. We tried to get a new high school built, but people in Fairfield wouldn’t pass a property tax increase to fund the new school. So the courts paired schools. Ninth and tenth graders were assigned to go to what had been the all black school, eleventh and twelfth graders to Fairfield High School, which effectively destroyed two high schools. It was just difficult, and folks didn’t go. White parents did not send their kids to the school, and so the next semester, the black school was just essentially closed down, and everybody went to Fairfield. That was a challenging time because you had two high schools in one building, and it was overcrowded, and they were making do. But I think that the issues we faced as kids made us better people. We ended up still pulling for everybody. We didn’t know what color somebody was underneath that football helmet. The band played together. The choir sang together. It was all a real school, and we worked it out together. Those were very important formative years for everybody that went to that school. Melissa Parker (Smashing Interviews Magazine): What were the main challenges you faced in prosecuting Thomas Blanton and Bobby Cherry for their part in the 16th Street Baptist Church bombing? Senator Doug Jones: The challenges were the time. Obviously, you had potential witnesses who were older if they were still alive. There were a lot of folks that we believed had information that could’ve helped put those pieces of the puzzle together that had passed away. By the time we got to this, it was 37-38 years after the fact, and a lot of those people had died. So having witnesses was a challenge. A lot of the evidence and a lot of the interviews were still there, but investigators had a very difficult time trying to find people again. That was always a challenge. The second challenge was just taking the evidence that we had and putting it together in a way that we believed proved to a jury beyond a reasonable doubt that these guys were guilty. In the case of Tommy Blanton, it was really a lot of older evidence that we used with his former girlfriend and an informant named Mitchell Burns. We found an undercover tape recording that really had him admitting to being part of the group that planned the bombing. Cherry was a lot different. The passage of time actually helped us with Cherry because he made admissions over the years. He actually bragged about it. In between the lies that he made that he told investigators in the 60s and 70s and the admissions that he made in the 70s and 80s, it was pretty strong and pretty damning evidence against him. So we had both challenges but also some things worked to our advantage. The real things that I think really worked to our advantage were the passages of time and the change of attitudes from the community. If this case had been tried in the 60s, it would’ve been white men who were sitting in judgment, and the odds of a conviction would’ve probably not been very good. But over the passage of time, you had women, you had African-Americans, and you had just a different attitude. People didn’t come in with the kind of racial prejudices that they would have in the 1960s. Melissa Parker (Smashing Interviews Magazine): Bobby Frank Cherry passed away in 2004, and Thomas Edwin Blanton, Jr. is currently serving a life sentence at St. Clair Correctional Facility in Springville, Alabama. Will Blanton ever be released on parole? Senator Doug Jones: His first parole was denied. He will be up again in about three more years now. I don’t see him being released from prison primarily because I don’t see him ever admitting his responsibility in this or expressing any kind of remorse or anything. He has maintained his innocence, and I think that one of the criteria for release ought to be some element of acceptance of responsibility for the crime. I don’t see him doing that. I guess it’s possible that should he become very, very ill of if he’s in hospice, he could be released. But aside from that, I will be surprised if he gets released because I would be shocked at this stage, having met with him a total of three times, twice in prison, if he ever accepted any responsibility for murdering those four girls. Melissa Parker (Smashing Interviews Magazine): Did you receive any death threats during the trials? Senator Doug Jones: No, we really didn’t. We were all prepared to respond should there be any threats to me or any member of the team or any of our witnesses. But we really never saw that. I was a little bit more uncomfortable during the investigation of the Eric Rudolph matter in the women’s clinic bombing. But as time went on, we heard people saying they don’t want to go back and revisit Birmingham’s past. But that’s a lot different than threatening people and doing some things. We were worried about it, but we never saw anything. We had generally a pretty strong element of support in the community. It was a cautiously optimistic support but still support nonetheless, and I felt very good about that, the fact that we didn’t receive any of that unlike Bill Baxley who used to routinely receive threatening letters and just ugly hate mail from folks when he was prosecuting the Chambliss case. Melissa Parker (Smashing Interviews Magazine): As we know, words matter. In Governor George Wallace’s inaugural address delivered on January 14, 1963, he shouted, “Segregation now, segregation tomorrow, segregation forever,” which was vehement and mean spirited. Flash forward to 2019, and Donald Trump will not condemn white nationalists as terrorists. Melissa Parker (Smashing Interviews Magazine): Do you believe that Donald Trump is just pandering to his alt-right base of supporters when he does not condemn white supremacy? Senator Doug Jones: I don’t know if it would be pandering to them, but he certainly doesn’t want to alienate them. The irony of that is that President Trump has such a strong hold on the Republican Party and his base that he could really be effective in trying to change a lot of this dialogue and bring people along to where the hate-filled rhetoric is just dialed back. Unfortunately, he’s just not done it. Having said that about him, I do think there are things that we can do in the Democratic Party and others to also call things out when folks say things that may be anti-Semitic or do things from a different perspective. We’ve got to be very careful. It doesn’t take much to incite things. We shouldn’t be, for instance, harassing legislators in public places and in restaurants when they’re out to dinner and in airports and things like that. That kind of disrespect shouldn’t happen. We shouldn’t be tweeting out ugly things about national heroes like John McCain either, which the president has been doing. I just wish everyone would understand. That’s why I think this book is important. If you look not just between the lines but read the overarching theme of this book, it is that words matter and that we have some opportunities, but we also have responsibility. But the opportunities are there to dial back this rhetoric. I hope that all people from whatever political persuasion will stand up and speak out when they need to and dial back that rhetoric. Melissa Parker (Smashing Interviews Magazine): Some Democrats and even a few Republicans are questioning the mental stability of Donald Trump. Your comments about that? Senator Doug Jones: There are so many things that are politically driven. I’m a lawyer. I’m not a doctor. I’m not a psychiatrist. I just think that people need to step up and exercise leadership. That goes for the president, and that goes for all of us from the members of the Senate to the House of Representatives and every public official. We have responsibilities to the people that put us in office to be leaders and not just to fan the flames of hate and to use vile rhetoric. Melissa Parker (Smashing Interviews Magazine): So place emphasis on accentuating the positive? Senator Doug Jones: Yeah. Well, I think you accentuate the positive, but when there is the negative, you need to stand up whether it’s the president or somebody in your own party. You just have to say, “This kind of rhetoric is wrong. We need to be more respectful of each other.” I think that is the key. That is one of the things that ought to be a lesson learned from what happened in Birmingham in the 1960s. Melissa Parker (Smashing Interviews Magazine): Republican Rep. Bradley Byrne said that he will challenge you in the 2020 senate race. Roy Moore said that if he decided to run, you’d be the first to know. Any hint of that? Senator Doug Jones: I don’t know. I don’t have a clue about what Roy Moore wants to do. I know he just probably is trying to raise money right now. That’s usually his MO. But you know, I’m doing my job in the United States Senate, and I’m not looking over my shoulder at anyone. I continue to do what I think is best. I’ve got a responsibility to do that, and that’s what I intend to do. I can justify every position I have whether people always agree with it or not. I can at least do it, and I always have those dialogues that I’ve talked about from the very beginning. So I’m going to do my job, and I’ll let anybody else that wants to fight it out over on the other side. Melissa Parker (Smashing Interviews Magazine): Will you be running in 2020 on issues that affect working class Americans like healthcare? Senator Doug Jones: Yes. I still think that’s very, very important. I’ve been a vocal proponent of expanding Medicaid. If we can do that in Alabama, it would bring in billions of dollars, and it would also give 326,000 healthcare that they really don’t have. I think that is just a no-brainer. I’ve got a bill in Congress that I think could incentivize states to do it. That was such a political issue even though a number of Republican legislators and governors, including then governor Mike Pence of Indiana, expanded Medicaid. There’s a huge issue of pre-existing conditions for healthcare. The cost of prescription drugs is a big issue. Trying to bring workforce development to everyone and education are big issues. We’re going to stick with those kitchen table issues. This year, we’re focusing some on veterans. I just filed a bill to try and eliminate the widow’s tax that affects so many military widows these days where they get penalized. At the end of the day, those are the kinds of things people sit down and talk to the spouse and kids about. Those are the issues we’re going to run on again. Melissa Parker (Smashing Interviews Magazine): As a US Senator now, do you have any regrets from your criminal defense career or as a U.S. Attorney? Senator Doug Jones: You know, I’m sure there are things that I would look back on like some trials and think I could’ve done a better job on some cases. Overall, I’ve been pretty satisfied with where I’ve been. I think the big regret that have is, even though we got the convictions in the church bombings cases and that was such an important thing for Birmingham and the country, the disappointing thing and the regret is that I couldn’t really get anybody to accept that responsibility and assist us and tell us the story. We had enough evidence to piece together to prove beyond a reasonable doubt that Cherry and Blanton were guilty of the crimes. But we really never had the details of what happened and when and who did that and who did that. I was hoping that someone would step up and have this late-in-life epiphany of the fact that they were wrong and that they wanted to make it right before they met their maker. That just never seemed to happen. So while we got the conviction, we were never able to fully detail the story, and I was hoping so much for the city that someone would stand up and accept responsibility because the one thing that we haven’t had in these cases is that element of reconciliation from those that committed the crimes. That’s an important part. It’s been important in so many cases. That’s the one piece that’s missing that I wish I could’ve gotten. Melissa Parker (Smashing Interviews Magazine): It can be pretty fierce and ruthless in Washington. Do you rely on your Christian faith day-to-day? Senator Doug Jones: What I believe is to treat all people fairly with dignity and respect. That’s not just a constitutional issue with me. It’s a faith-based issue as well. I think we have to be good stewards of the planet and take care of the planet that God’s given us. So it’s always a part of you. I don’t mean to be critical when I say this, but I’m not one to do like so many and wear my religion on my sleeve. I just try to do that in the works that I do, and I think I’ve been fairly successful in that over the years. Melissa Parker (Smashing Interviews Magazine): Any aspirations to become president one day? Senator Doug Jones: No (laughs). My age is catching up to me on that. I love the Senate. I enjoy being a US Senator. I’m incredibly honored to be there. I started my career right out of law school working for the late Senator Howell Heflin who I thought was one of our state’s great public servants. He taught me an awful lot, and to be there in his seat is truly just a Godsend for me and remarkable. So I’m pretty happy where I am. It’s grinding sometimes, but when I get up every day in Washington, and I go to that office that says, “Doug Jones US Senator,” I just pinch myself that I’m there, and I hope to stay there for a long time. « Sophia Lillis Interview: Meet the New "Nancy Drew"
As usual, this is a magnificent interview. I was so happy when he won the election and he’s not even from my state. Kudos, Melissa!